Sentenced as Edward Moyle, to seven years transportation at Launceston Cornwall on 19 March 1785 for theft of two cloth coats, value 50s and other goods value 17s 8d, from the dwelling house of Benjamin Barrett. Moyle and his partner John Rowe, were found guilty of stealing the goods, but not guilty of breaking and entering the house in the day. Moyle was on the Dunkirk hulk early in 1786 before embarking aboard Charlotte, but later transferred on 6 April 1787 to Scarborough, a month before the Fleet sailed. At Port Jackson in 1788 Moyle was landed as Miles, the name henceforth in records. In May 1797 he received a 30 acre grant at Prospect and in 1809, 70 acres also at Prospect was registered. Miles does not seem to have worked these grants himself. Three daughters were born to Miles and his wife Susannah Smith (Glatton 1803), Susannah 1803, Martha 1807 and Elizabeth 1810. From 1810 till at least 1826, Miles lived at Macquarie Field Minto. In 1820 he was living with Mrs Ryan at Illawarra and working as a Carpenter. His wife Susannah was working as a servant to Robert Aull at Evan. Edward Miles died on 19 August 1838, as a farmer, aged 77. He was buried at St Matthew’s Windsor. Susannah joined her husband on 4 December 1838. Became known as Franky Doodle when stationed at Ostrovo Macedonia, a field hospital unit of 200 tents situated near Lake Ostrovo, under the command of the Serbian Army. It was called the American Unit as the money to fund it came from America and except for a few dressing stations, it was the Allied hospital nearest the front. 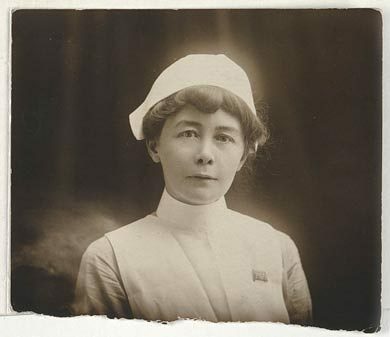 The tent hospital was under the leadership of Australian Doctors Agnes Bennett and Mary De Garis. The unit was approximately ninety miles west of Salonika, and was in a beautiful location. Miles Franklin wrote: The royal sunlight on the purple hills! Blue as heaven, high and peaked like cats’ teeth, they intensified a longing for the Blue Bogongs that was ten years poignant. Other accounts from of her time in Ostrovo were her diaries, other writings and the finished Ne Mari Nishta.